How do I end an Alien Fregate? 2 Arc 9000's should do the trick, maybe with a weapon damage modifier active too. Maybe throw out some drones and cloak too. It seems certain individuals are giving tips against Alien Gunships (much smaller, no hardpoints, moves around with shield recharge drones) versus the enormous Alien Frigate (much larger, tons of hardpoints, does NOT move around with small Alien Fighters zooming around it). The hardpoints on the exterior of the ship that look like little glowing white spheres are PRIORITY; you have to destroy all of them to bring the Frigate down. There are usually about 10 of these; 2 on the bottom, 2 on the top, 2 on the left side, 2 on the right side, 2 on the back between the engines. This is not always the case, though. I've also come across 3 on the top and only 1 on the bottom. It's important to note that the other hardpoints (lasers and the like) CANNOT BE DESTROYED independently. Their health pool is that of the ship's hull; you MUST destroy all the white sphere hardpoints. Also, Missiles will NOT lock on to these hardpoints; they MUST be focused down using the Primary Weapons [or an Arc 9000]. Make sure you are constantly dodging the huge lightning beam laser ball blaster of death, as well. Take out the drone generator first. If you don't do that, then you will never get rid of the shield drones. Then take out the drones, then take out the turrets. Make sure you have the cloak option (mk 3 is what I had) and have damage mods. If you have any drones of any kind, launch them. Oooo~ Thanks a lot for that Giraffasaur. Next time I see one blocking my jumps, I might have a chance. Instead of be curling up in a ball and sobbing at the loss of the last hour of gameplay. For Alien Frigate, you have to destroy specific part of the ship. For Alien Warship, you pretty much doomed. 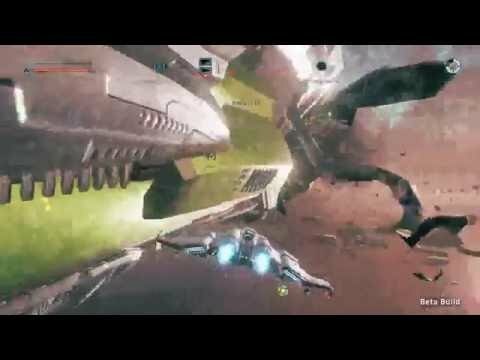 For Alien Gunship, simply attack from far and use clock if you're low on health. Or you know... Be stealthy. I activate my cloak then switch to my teleporter and get near. Do the hack and Dr Zoidberg away! You can't hack Okkar Frigates. You must be thinking of Okkar Corvettes. The okkar corvettes are fairly easy to kill once you know how. Their shields recharge fast, but some weapons like the fusion blaster can out do it (even more if you use devices that buff damage output). Combine this with a few plasma torpedoes or heavy missiles and the corvette dies really fast. Also, if you use a drone "highjacker" consumable you make the shields drone heal you instead while you destroy the covette shields and hull. Made me giggle just a little bit. I used to dread Frigates, but i got 2 on my first successful run in 0.4. Frigates are somewhat easy to deal with if you carry some Arc-9000. Arcs will do massive damage to it and also cripple it's guns so it's almost helpless. You still have to deal with fighters and drones showing up but it's a lot easier then. The generators are not that sturdy, gatlings or fusion blasters quickly destroy them, the biggest hassle is locating them while dodging all the enemy fire. It's also quite helpful to have a tractor beam so you don't need to get inside to loot everything.